It's easy to use your discount plan. Once you join the plan and receive your membership kit, simply follow these steps to start saving today! Some discount plans will have specific directions on how to use the plan, so please review your membership kit for details. No, this is not an insurance plan. Our savings plans provide you with discounted prices on a wide range of care services and products; you will pay for services at the discounted price at the time services are received. At the time of service, show your membership ID card and receive the discount off the regular-priced fee. It is that easy. If you have any questions about how to use your savings plan, call our Member Services department toll-free (800) 290-0523, any time between 7 a.m. and 7 p.m. Monday - Friday CST, for prompt and friendly assistance. 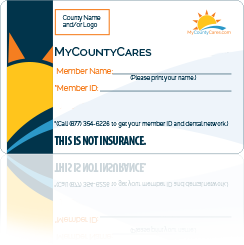 Find a MyCountyCares Plan that fits your needs!